This is for eastbound traffic coming off the east end of the trestle tonight and Thursday. A heads-up for drivers headed east out of Everett across the Hewitt Avenue trestle tonight and tomorrow (July 11 and 12th). Here’s the info. sent from Washington State Department of Transportation. 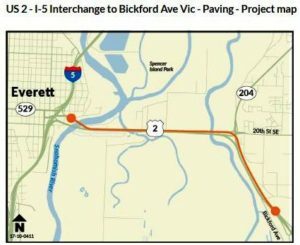 People who use eastbound US 2 to get from Everett to Snohomish during the overnight hours should plan extra time into their travels tonight and tomorrow, July 11 and 12. Contractor crews working for the Washington State Department of Transportation will close all lanes of eastbound US 2 between the State Route 204 and State Route 9 interchanges to stripe a newly paved section of the highway. This weather-dependent work is part of the US 2 preservation and rehabilitation project. From 7 p.m. to 6 a.m. nightly: The westbound SR 204 ramp to eastbound US 2. From 8 p.m. to 5 a.m. nightly: All lanes of eastbound US 2 between SR 204 and SR 9. Large trucks should follow the signed detour via eastbound SR 204 and southbound SR 9. Small vehicles and light trucks should follow the signed detour via 20th Street Southeast and southbound SR 9. People traveling on the eastbound US 2 trestle can still access eastbound SR 204 during the closures. In the Snohomish County area, drivers can get real-time traffic information on their phone with the WSDOT traffic app, following the WSDOT traffic Twitter feed and get advanced information from the Snohomish County Construction page.